For The Person on Your List Who Has Everything… Hobie X Fender. This one-of-a-kind guitar / surfboard combination will only be available through this charity auction. Classic 1960s surfing takes shape in the most iconic Surf Rock instrument, the Fender Jaguar. Of only three Hobie X Fender guitars in the world, this is the only one made available to the public. 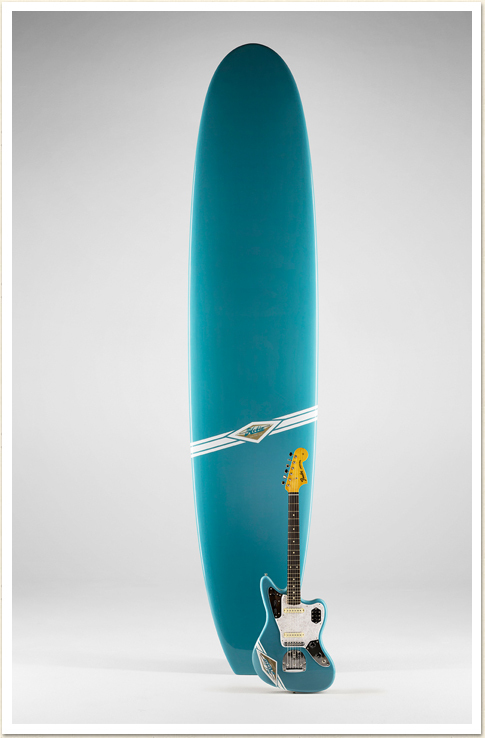 The Fender comes with the matching Hobie classic longboard, completing your Surf Rock collection. Hobie surfboards has always stood for quality, innovation and craftsmanship. Hobie has always led the way when it comes to innovation in surfboard design. The finest shapers, designers and board builders in the world have left their mark in the shaping bays of Hobie Surfboards. To this day, Hobie Surfboards are still made in the same factory in Capistrano Beach, California – turning out some of the most sought after modern masterpieces of foam and fiberglass in the world! Length: 9’0″ “Replica” early sixties Vintage Model. Fin: Classic glass on laminated wood “D” fin. Also included in this package is the Classic Player Jaguar®Special guitar. This guitar updates the time-honored Jaguar model with several thoroughly modern improvements, including hotter pickups, cut switch, Adjusto-Matic™ bridge, 9.5″ fingerboard radius and neck pocket with increased back-angle for improved stability and sustain. This entry was posted in Hobie History, Hobie Shop, Hobie Surf and tagged blog, california, Dana Point, Fender Classic Player Jaguar, fender guitar, Guitar, hobie, Hobie Alter, Hobie surf, Hobie Surf Shop, Hobie Surfboards, Hobie X Fender, Laguna Beach, longboard, surf shop, surf shop blog, surf shops, surfboard guitar, Surfing, Tracey Engelking, waves for water. Bookmark the permalink. ← Hobie Shop :: Shop Small Saturday with Us!! Hey Tracey! So the rareness of the guitar is what is driving the high minimum bid? That $10,000.00 minimum bid is SHHHH-teep. Good luck with the auction! Definitely spread the message far and wide to try to find a collector who would be interested in the auction due to the guitar, if that is the draw. Waves 4 Water looks like a great cause! See you in the water. Good news – you finally got a bid! I was worried. Good to see you and the whole Hobie Team at Hostility, I mean HOSPITALITY Night on Friday.